A friend recently lamented to me that she wished men could treat relationships like they would a business deal. In business, is it common practice to talk nice with a potential business partner over the course of a few dates then vanish into thin air? When you’re not interested in the deal, you’re honest and upfront about it. No need string anyone along. Besides, stringing someone along in a business context, choosing to act without open and honest communication, could be bad for your reputation. The world is small, whose to say though today’s business deal didn’t work out, there isn’t an opportunity for other ways to collaborate down the line? But my friend has encountered a number of guys who apparently aren’t in the business of open and honest communication. What happened to meaningful cliches like honesty is the best policy? Or the truth will set you free? I can’t blame her, though, in our relationships with the potential “one”, it’s easier to stick our heads in the sand or to run away than it is to be honest about how we feel and work through those challenges together. I’ve done it. Actually, I’m a repeat offender. This was actually what my 21 days of writing in November evolved into. It was the first time that I did not stick my head in the sand, or run away. It was the first time I sat down with myself and faced my fears deep within myself for an extended period of time. It was not a one-off conversation, I made it my business for those three weeks. And I committed to making a habit of being vulnerable. It was the first time I was able to be completely open and honest with the “one” about all my problems. And trust me, I have a handful. But as long as we’re being open and honest with each other, I know you do too. We all do. I suppose the only thing that sets us apart are the people who are honest with themselves about their issues and those that aren’t. But that’s too easy isn’t it? Let’s step back for a second and re-think for a moment. How many types of us are there? First, there’s the people who are honest with themselves AND with others about their issues. A rare breed. I wonder how much of us actually reach this nirvanic level of self-awareness, self-understanding, and vulnerability? Second, there’s the people who are honest with themselves, but may not be confident enough to share this with others. Third, there are the people who know their issues, but may not have found all of them. Or maybe they have yet to realize just how those issues affect them. This number three speaks most to me, that’s where I was earlier this year. Fourth, there are the people who have figured themselves out, and everyone else out. It can be such a challenge to wait for others to figure themselves out. Life will be better when that happens. So this friend of mine has been sending me these great articles on marriage that I’ve been totally digging. The one that kept me up last night and has me still thinking today you can find here. It’s an absolutely brilliant read, if you choose to read with an open mind. One of the greatest privileges of being on one’s own is the flattering illusion that one is, in truth, really quite an easy person to live with. With such a poor level of understanding of our characters, no wonder we aren’t in any position to know who we should be looking out for. This problem is compounded because other people are stuck at the same low level of self-knowledge as we are. However well-meaning they might be, they too are in no position to grasp, let alone inform us, of what is wrong with them. Naturally, we make a stab at trying to know them. We go and visit their families, perhaps the place they first went to school. We look at photos, we meet their friends. All this contributes to a sense we’ve done our homework. But it’s like a novice pilot assuming they can fly after sending a paper plane successfully around the room. If the title wasn’t enough to reel me in, then I can definitely confirm I was hooked after the first line. And I couldn’t stop reading after reading why we don’t understand ourselves – or others. But, please, before you go any further with what I have here, please open this up in a new tab and read from start to finish. I regret that might not be possible. But I won’t stop without trying. This selection got me back to thinking about my friend, business, relationships with the “one”, and the business of relationships. Having learned much of what I know in business much like how I’ve learned the most important lessons in life – trial by fire – I’ve come to know that before we get too far into the conversation, the best business deals I’ve done include an early conversation about all the bad stuff that can, might, and/or will happen. Funny, in romantic relationships we don’t want to touch this topic with a 100 foot pole. And why not hit these challenges head on? Knowing what I know now, this is probably one of the most informative and intimate conversations you can have with a potential “one” and could do incredible things for mutual understanding and empathy with such a proactive approach to problem solving. I’m having a hard time imagining a conversation that could be more meaningful. Even if we are super self-aware and think of ourselves as highly empathetic, it’s a lot easier to express empathy when you have more information than less. It’s also a lot easier to express empathy while calm, cool, and collected rather than under stress and duress. This may come natural to some of us, but I’ve only been able to improve through preparation and practice. So if you haven’t already, Read This. And share it with someone that matters to you. I’ve already shared it with my family. I’m curious, what do you think? And if you’re already tired from reading, take a look at the video below (4:00), it’s almost (or equally) as excellent. This was my first time on The Book of Life site. I’ll definitely be back for a return visit some day, sooner than later. At first I had a different picture in mind, but then I got to thinking about vanishing. 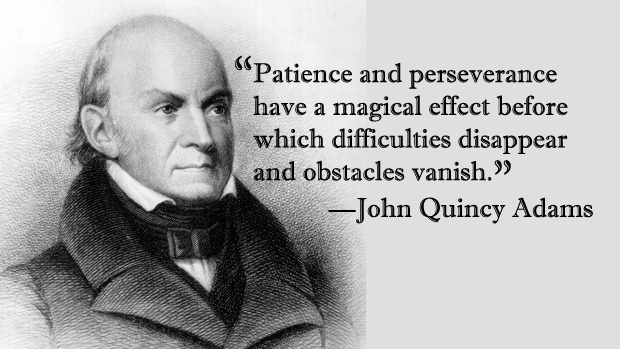 I came upon this quote by John Quincy Adams from this page on Pinterest that seemed to put a twist on the relationship between patience and perseverance, disappearing and vanishing. The running away model of vanishing cannot hold a candle to how difficulties disappear and obstacles vanish when one is patient and perseveres with what and whom matters most to them. 21 days of writing taught me that. And it’s remarkable how the difficulties and obstacles of yesterday almost no longer seem relevant, even exist. Think I’m crazy? Give it a try yourself. A true, concentrated effort. You might surprise yourself. I know I did. This entry was posted in 60 Day Challenge and tagged 21 days, business, challenges, collaboration, communication, honesty is the best policy, marriage, open and honest, opportunity, partner, problem, relationships, self-awareness, self-understanding, stringing someone along, the book of life, the one, the school of life, the truth will set you free, vanish into thin air, vulnerability, wikipedia. Bookmark the permalink.